Craniofacial clefts are very rare and manifest in a variety of patterns. Tessier classified these clefts in 1973 and numbered them 0 to 14. Tessier No. 4 Facial cleft is a rare variant of craniofacial cleft. Not more than 50 cases are reported in world literature, amongst which only 5 cases are true bilateral in nature. However, combinations of two different variants are not very uncommon. A case of male Indian child aged 4 years with a true bilateral Tessier No. 4 Facial cleft is reported. He also had anophthalmos of the left eye. This is probably the first case in which true bilateral Tessier No. 4 Facial cleft with anophthalmos of one eye is noticed. 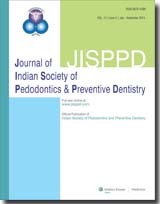 The need for dental treatment in paediatric dental patients is immense. The present study was carried out in fifty children in the age group of five to ten years of age with recurrent episodes of dentoalveolar infection. Advanced pulpal infections led to torsion in 54 percent, premature eruption in 46 percent, crater like bone loss in 36 percent, sequestration and dilaceration in 10 percent and 6 percent respectively. Most of the developmental disturbances could have been avoided with timely antibiotics and endodontic intervention. Cephalometric Norms from forty South Kanara children were selected and it was found that these children have a tendency towards class II skeletal relation. Females showed a protrusive Maxillary and Mandibular base. Certain new landmarks were also introduced, the value of which gives the molar relationship. Length of Maxillary and Mandibular bases were also standardised for class I cases. The treatment planning in mixed dentition period has changed from extraction to non extraction. Any orthodontic treatment must take into consideration the growth trends and the pubertal growth spurt. The two cases presented here were treated during mixed dentition period in different ways: one with fixed appliances and the other with removable myofunctional appliance therapy, with satisfactory results. Hence for a conservative treatment approach, the non-extraction treatment is recommended in mixed dentition period. Reattachment of the original tooth fragment to the fractured tooth provides benefits of maintaining the tooth's shape, colour texture and translucency in the restoration. This paper describes fragment reattachment of a non-vital central incisor five months after trauma. A case of fourteen year old healthy girl with complaint of a discharging sinus on the lower right side of face is reported. All teeth were vital and there was no evidence of periodontitis. There was no history of extraction of a tooth. Total leucocyte count, differential leucocyte count, fasting blood sugar, chest x-ray and routine urine examination were within normal limits. Actinomycosis and scrofuloderma which simulate such a condition were ruled out by culture study. The intraoral periapical x-ray of mandibular molar showed questionable periapical changes at the time of presentation. But definite osteolysis was observed in the repeat radiograph after three months. It was decided to extract the second molar and curette the sinus tract. The extraction proved to be difficult. On examination of the extracted tooth, it was found that the mandibular second molar and second premolar were fused together. The radiograph of the tooth taken after extraction showed confluence of the premolar pulp with the periodontal membrane. On follow up, the lesion was found to heal satisfactorily. India, a developing country faces many challenges in rendering oral health needs. The majority of Indian population resides in rural areas, of which more than 40% constitute children. These children cannot avail dental facilities due to inaccessibility, financial constraints and stagnation of public dental healthcare services. This entails the health professional to adopt a more practical approach to achieve primary prevention of oral diseases. The most viable solution seems to be dental health education. Documented evidence shows that teachers and parents can augment dental health behaviour. With this background, it was decided to target children in a rural area for comparing the effect of education on children alone, children coupled with teachers and children with the involvement of their parents. An interventional study of 4 months duration was conducted on 430 children, 7 teachers and 100 parents. The parents were educated at home. Clinical oral health status was assessed prior to the delivery of dental health education and also following the intervention. Results showed that the dental health scores improved best in the group of children involving the teachers. It was concluded that teachers could be targeted in order to enhance the effect of dental health education campaigns on children.